I've wanted to do this for years: profile families and individuals who are reshaping America, starting at the dinner table. One of the reasons that food is such a passion point for me, and why I've chosen to work in food media, is because food isn't just a physical need—it's a unifying cultural force, and I think the opportunities around humanist storytelling in food and drink—and the power those stories could have to affect real-world change—are infinite. 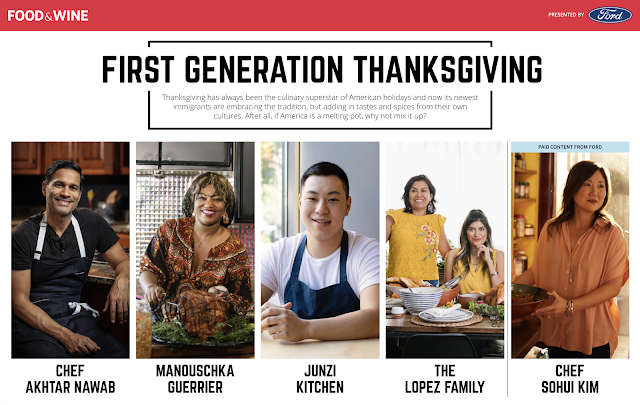 It seems especially important, and poignant, this year, that we're able to bring First Generation Thanksgiving—which I have literally been imploring the media outlets I've worked at over the past few years to do—to life, with the generous support of our friends at Ford. This is America in 2017. You're welcome at our table.